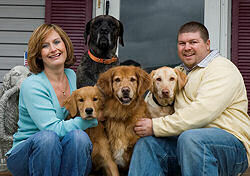 It has been a life long passion of the Cole Family to provide a fun and stress free experience for both owner and dog. The Bigger the Better Canine Camp specializes in Large/XLarge breeds and senior/special needs dogs. As owners of Golden Retrievers, Mastiffs, Labs and geriatric pets, we understand how difficult it is to find a safe, clean, loving, and spacious place to comfortably leave your animals. This 20 Acre canine camp nestled deep in the woods is a perfect setting for a “Home-Away-from-Home”. The unique features to this rural retreat will combine health, safety and comfort. The indoor conditioned suites incorporate natural light and fresh air during the day and safe quiet sleeping quarters for the night. In order to provide the best care for your special family friend the number of guests we service are kept to a small minimum.